When you're a CAT guy… Note that we said “CAT guy”, which is NOT the same as “cat guy”… When you're a CAT guy this decision should be easy. Or maybe you're just a hoodie guy. Or maybe you're a hoodie kind of woman. When any hard-working person, whether ... (see full details) (see specifications) #1910802-004. When you're a CAT guy… Note that we said “CAT guy”, which is NOT the same as “cat guy”… When you're a CAT guy this decision should be easy. Or maybe you're just a hoodie guy. Or maybe you're a hoodie kind of woman. When any hard-working person, whether that's a weekend warrior or a regular 9-to-5er, needs a good solid sweatshirt so look no further than this good cotton/poly blend. This Men’s 1910802 004 Grey Logo Panel Hooded Sweatshirt from Caterpillar is so comfortable it'll become your favorite, hands-down. With just enough cotton comfort and durable polyester performance mixed in, the sweatshirt will be your go-to for all projects and leisure activities when the temperature starts to drop. This long sleeve pullover sweatshirt is cotton amplified. Cotton has long been the favorite material for clothing of any kind due to its incredible comfort. However, polyester brings the performance, so that is where bringing together cotton and polyester in a delicate blend can give you the stretch you need for a better fit with the comfort, softness, and warmth you want. Durable polyester adds strength to your clothing making them even better for work than ever before. The 80% cotton 20% polyester blend fleece in this work hoodie sweatshirt is the perfect balance of strength and comfort. This long-lasting hoodie won’t just work hard for you, it will earn its place as your favorite. Not to mention the cool design and logo on the sweatshirt makes it perfect for any hard-working guy or a girl. Looking for a great gift for the hard-working person in your life? Look no further than this gray Caterpillar logo sweatshirt. Made in men's sizes, this work sweatshirt is perfect for any hard-working guy. The attached three-piece hood is easily adjustable with the drawcord and perfectly comfortable without giving a conehead look in the back when worn. One large lower kangaroo pocket allows for tool storage and easy access to important items whenever needed. The embroidered CAT logo is not going anywhere, it's stitched in place for a long-term style. 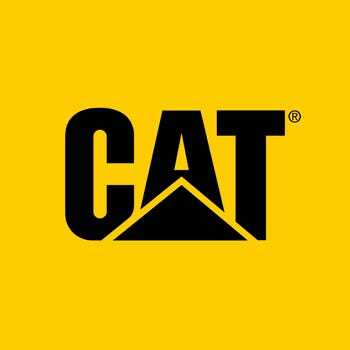 The Caterpillar logo on the arm will let everyone know what a hard working person you are. The handsome gray color is accented perfectly with a casual style that looks just as great on the job site as it does at the tailgate. Add some custom embroidery for you or your crew, just ask us how! Ribbed knit cuffs and a rib knit waistband give you the perfect seal around the wrist to keep debris out in around the waist to trap and body heat. Embrace your inner CAT fan, but leave the catnip out of it. This is a next-generation hard working sweatshirt for the hard working person. Caterpillar makes some tough equipment and some tough working clothing too, making this Men’s 1910802 004 Grey Logo Panel Hooded Sweatshirt the perfect fit for you. CAT Apparel Sweatshirts: Men's 1910802 004 Grey Logo Panel Hooded Sweatshirt is being added to your cart.